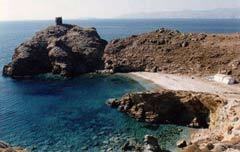 Pyrgos lies at the western coast in the Korthi area. We can reach it through the same country road that leads to the beaches Kaminaki, Vlyhada or taking the road from Psoriariza. It is a nice sandy beach. At the north-western edge of the beach we can see the Enetic tower of Makrotantalos.